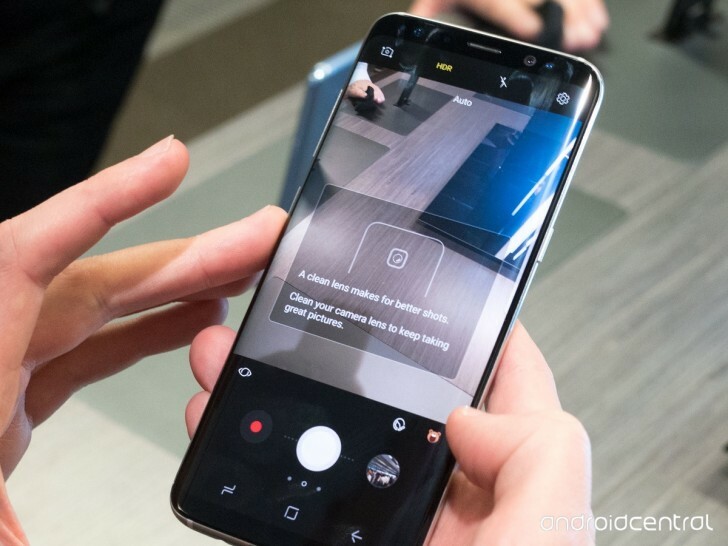 One of the things many people wanted not to believe when the barrage of S8 leaks came around over the past few weeks was the new position of the fingerprint sensor. Not that it would be on the back of the S8 duo per se, but its location next to the camera lens. Like, really close to it. And off-center. Perhaps not wanting its new flagships to look similar to many other Android handsets that have a circular fingerprint scanner centered horizontally on the back, Samsung went with an oddity that's bound to create some problems for those that use both that sensor and the main camera a lot. And the company knows how bad things can get. Take a look at the image below. Yes, that's the camera app reminding you to clean the lens. While it doesn't explicitly say anything about the fingerprint sensor's position, it's pretty clear that's what all of this is about. After all, it's the first time when Samsung has fitted such a friendly reminder in its camera software. Also, this will not be shown if you choose not to use fingerprint authentication. On the other hand, if you do, you'll initially see the reminder when you open the camera app for the first time after having set up your fingerprints. And then it will periodically pop up again and again, never letting you forget that Samsung could have done better on that one design trait of its new phones. But LGs are positioned NOT near the camera and it is in the middle. Well, we'll know upon its arrival.